i’m posting on my old blog because I don’t like publishing things on facebook directly. then they might try to say they own stuff of mine and that’s just not OK. However, I wanted to share this awesome thing I just made with you. No, I don’t have pictures because I ate it all already. 😛 It was a creamy, purslane and egg salad. It was delicious!! I took two eggs and hard boiled them, and meanwhile took about an 1/8th of a large onion and chopped it finely. Then I took a hand ful of purslane, chopped it up coarsely and a handful of shelling peas (shelled) and threw it all in a bowl. When the eggs were cooked and cooled I chopped them in and added a dollop (love that word!) of mayo and salt and pepper to taste. HOLY DELICIOUS! Well, I didn’t think I would eat all of it because it was a lot of food. but I did and was it ever yummy. Hope you enjoy it, if you try it! HOORAY! The new site is up! Please find all new material, more focused content and all the same love over there! Also, please remember to switch your subscription if you haven’t already. With a bar of handmade, raw chocolate in hand, I gather the strength to announce: the blog is going to receive a full-blown overhaul! I am going to take down this blog and create a new and improved blog! You will still have fun insights about food, parenting, life and love. I will not be moving the whole blog, but will be keeping some of the posts when I move. Unfortunately, that means that we will lose the comments, but I know we will be able to have great and broader conversations at the new blog. It also means that if you have subscribed (thank you to all of you!) that you will have to resubscribe at the new blog, which I will ensure will be easy. I feel like this is the best decision so that I can create the best content for you and create the most success for me, and hopefully some of you too! Thanks for your patience as I recreate the new blog. It will be worth it. First of all, I would like to update you on last week’s experiment of fermented zucchini relish. I let it ferment for about 4.5 days out of the fridge and the rest of the week in the fridge. The outcome: PURE DELICIOUSNESS! It tasted a little like salsa, which seemed strange as there were no tomatoes in it. I ate it tonight with my dear friend BloodBeard on a beautiful omelette. Between the two of us, we finished about 2/3 of the batch. So, needless to say, it was a total hit and I will make more again. YAY! This week, has been lovely: super hot during the days and cool at night. The day time heat inspired me to cook less and try more cooling foods. As I am rather abundant in the world of cucumbers these days, I decided to try something that was mentioned in the book “Animal, Vegetable, Miracle” by Barbara Kingsolver (who is one of my inspirations in life). Searching on the net I found a wonderful Martha Stewart recipe (of all things… really!). I changed it around a bit and omitted the roasted beets because there was NO way that I was having the oven on 400 for 45 minutes. Not even a little bit. 1. Saute onions and garlic (in whatever form you have it) in oil until translucent and soft, about 5 minutes. Let these cool. 2. In a blender, whiz up yogurt, water, cucumbers and onion mixture. I put the yogurt and water in the bottom of the blender because it allows for easier blending. This may need to be done in batches, depending on the size of your blender. 3. Put this mixture in a bowl in your fridge for at least a couple of hours. I did mine all afternoon. 5. Bask in the refreshing tang of cool cucumber soup. I fed this to three other people who all loved it. It was not such a hit with little A, but she’s a little picky these days. What can you do? This, in all, took about 15 minutes to prepare and lasted me, and my friends, about four meals. It is such a cool, refreshing snack too. Did I mention it was cool and refreshing? 😉 because it really is! This is a journey we are embarking on together. While my blog is not, currently, my financial livelihood, I certainly intend it to be that some day soon. Because, I need an income and I really don’t want to work away from home, and writing is my passion. It seems that blogging is the best way to go about starting a writing career as it is cheap, easy, accessible and lots of people read blogs. So, I have been researching how to actually do this, because I am a firm believer in NOT reinventing the wheel, though I am also stubborn enough to actually try to every time. However, it is much easier not to get the urge to reinvent the wheel when I know absolutely nothing about how to go about doing something, like say, making a living from blogging. Luckily, there are people out there, like Leo Babauta, from Zen Habits, who actually do. Better yet, they are willing to share their experience with others! Isn’t that nice? I think it is, very nice indeed. The reason why I’ve picked up on researching what Mr Babauta is doing is because his blog reached Time magazine’s top 25 blog list, with over 150K subscribers, and, he seems to be quite open about actually informing others what he perceives as keys to his success. 1. Write for your readers. Make good quality posts that interests the people that you want to read your blog. If you’re the kind of person who writes about music, then make your blog geared towards musicians. For me, however, this is an interesting point. I’m writing about my life. Who is interested in my life, other than my family and friends? How do I attract more people to be interested in my life? Not like, say, Coca-cola, but something that people come to know as “you”. If you are writing about lawn ornaments, then you are the “lawn ornament person” and you need to establish yourself as such, not just within the lawn ornament community, but also the gardening, home-making and decorating communities as well. To the point where if someone wants information about lawn ornaments on the web, they come to your blog, because it’s so darn informative and is consistent with what the readership believes they are coming to read about. 3. Read other people’s blogs and comment on them, linking back to your own site. I like doing this, but sometimes fear getting lost in the blogosphere, because there are just so many amazing and interesting people in the world. 4. 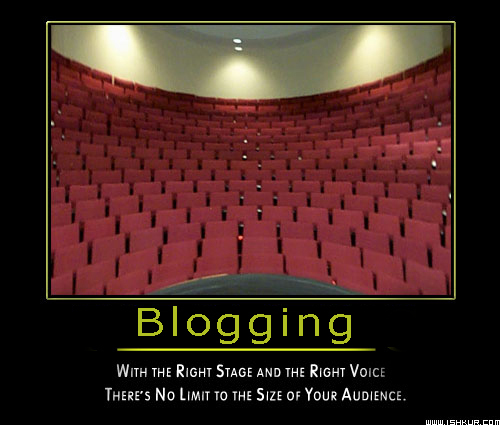 Try to engage with other bloggers in your “field”. I put “field” in quotations, because I don’t really like looking at it that way. I prefer the word community, but field is the word that is generally used. So, if your “field” is personal development, then try to engage some well-known personal development bloggers who might think you’re neat-o and link to one of your posts. 5. Be kind and open to your readers. This, for me, is a no brainer. Even if/when people start saying mean things, they are still your readers and have at least taken the time to read your post. Always reply with your voice in mind. If you are writing a meditation blog, don’t tell someone off if they don’t like what you say. It discredits your “brand”. This is what I have learned so far. There are other things, like design, ways to make your blogs more readable and all that jazz. All of it can be found through this handy site that Leo Babauto and Mary Jaksch, called: A-list Blogging Bootcamp. Most of it is free, and then there is some pay-for-membership stuff, that is community oriented. I haven’t even got through the non-pay stuff yet, so haven’t signed up yet. I encourage all of you to check it out, if you’re wanting to write a blog that makes you an income. And, in light of all that, I am doing some serious soul-searching about what structure, focus, lay-out and image I want to have for this site. I want it to be authentic and I also want it to be my financial sustenance. I hope to keep it personal enough that family and friends still want to come by, but informative and interesting enough that new people will want to stop for a visit too. You can help with that by sharing this via Facebook, or Twitter. I am home now, and the anticipation of seeing my garden is passed. I now know all the ins and outs of what has happened since I left. The sad news is, unsurprisingly, my cucumber plants did not overcome downy mildew and are now in the final stages of the disease and will, most likely, be completely dead by the end of the week. The happy part is, the cucumbers hadn’t all been affected yet, and so I got to harvest a giant bowl of them! Most of them are too big for pickling, but I feel like I will probably ferment some relish instead and maybe make a nice, cool, cucumber soup. 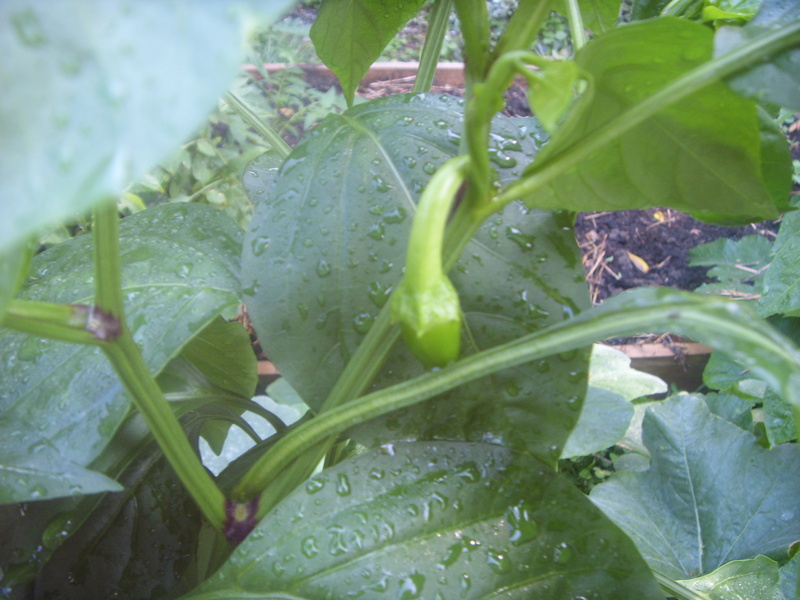 The most exciting news is, after gorging on nitrogen and growing into bushes, with no fruits, one of my pepper plants has a glorious, baby pepper growing on it! Hopefully it will be able to mature before the end of the growing season. 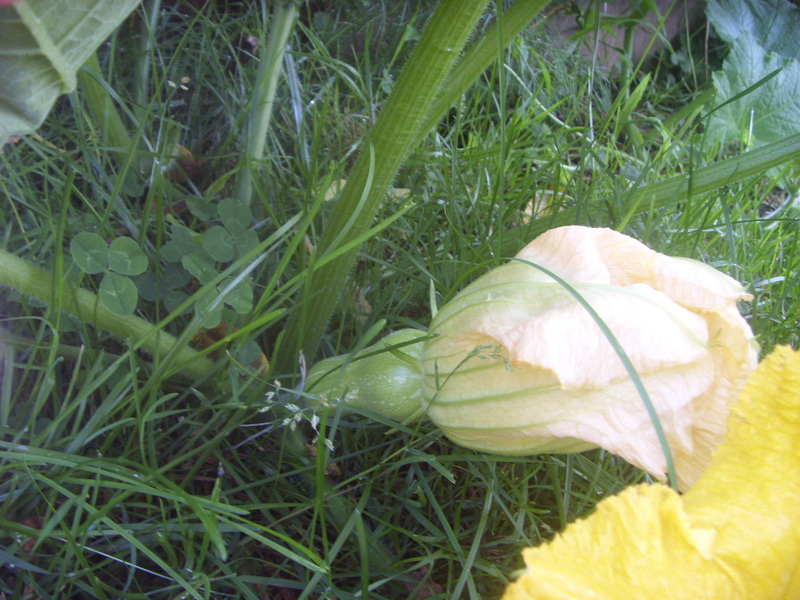 Another piece of exciting news is that my squash are reproducing now and I have at least two squash growing. The sad news is it looks like they may have powdery mildew. All this humidity is a real excitement for the fungi family this year. 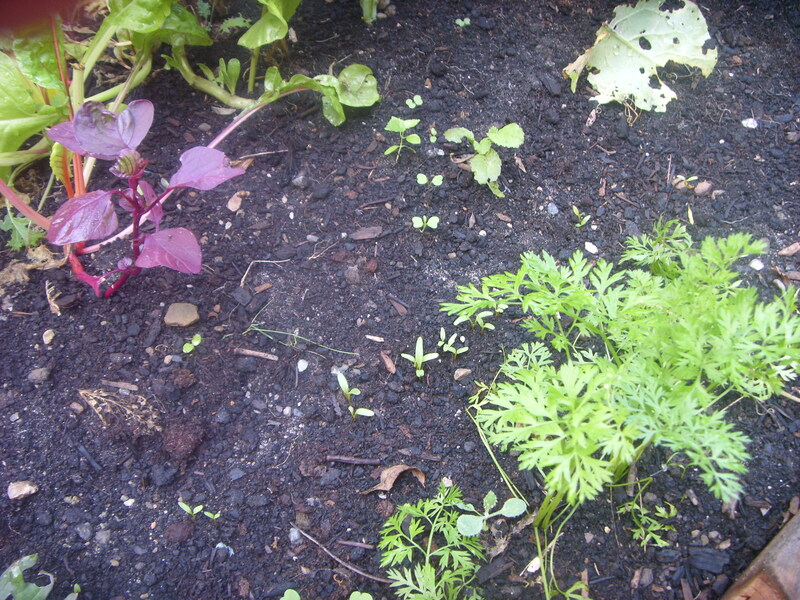 My carrots, beets and peas have all sprouted, as have my basil seeds. Calendula is still blooming, though I was able to pull up some plants that had obviously completed their life cycle. If they have their way, my whole garden will be calendula next year too! Zucchini is easing up a little on the crazy production of fruits, which is fine by me as I’ve eaten more zucchini this year than ever before. 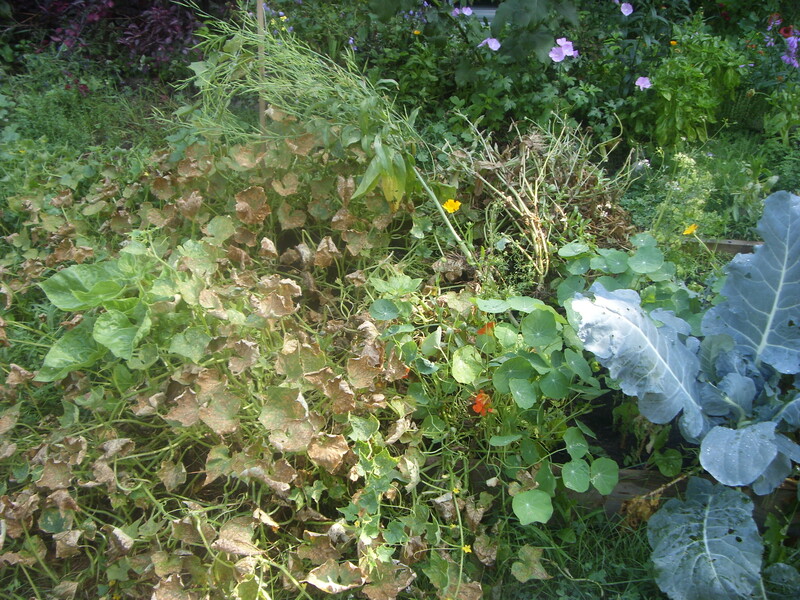 The potatoes are seeming pretty happy and my fig tree is putting on foliage like crazy, which is awesome considering it got sunburned badly earlier this spring and lost ALL of its foliage. So, maybe next year we’ll be able to get a good harvest of figs from it…. Another sad loss was my coriander seeds which seemed to have been removed/”maintained” by someone in my absence. Instead of a beautiful bounty of many seeds, I came home to a small handful that was left on a seriously trimmed stalk. 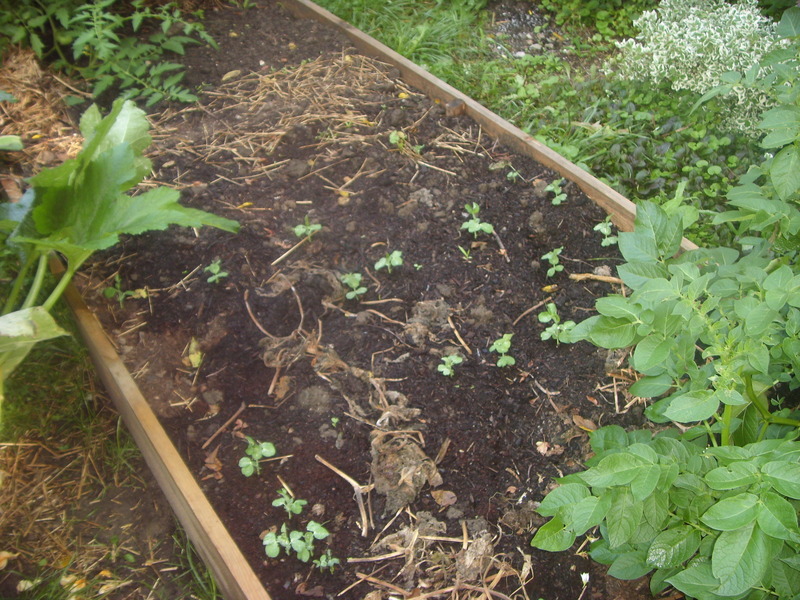 So, I planted them in the space they were before and maybe I’ll get some cilantro out of it. 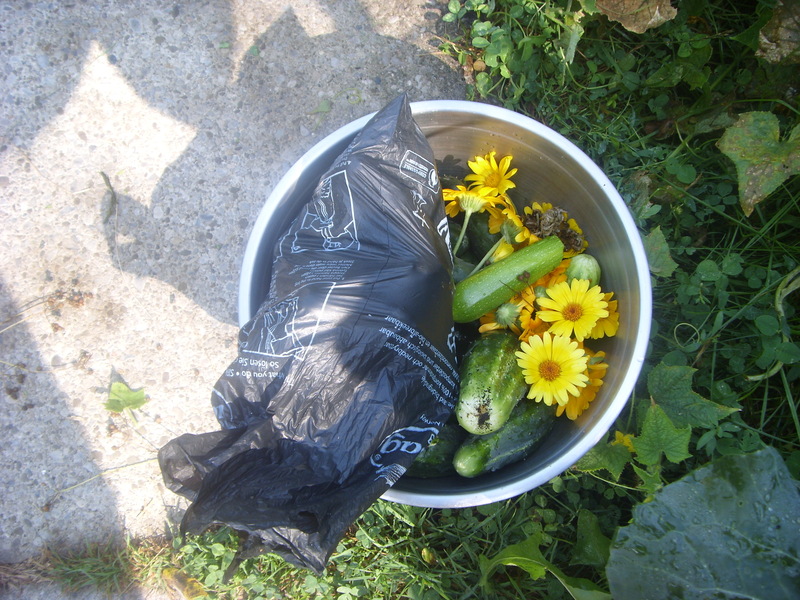 It was so nice to come home to the bounty of my garden. I love it. I love the picking, the weeding, the growth and the death. All of it reminds me of how precious our food is, and how much effort goes into growing good, organic produce. Today, I spent the morning with little A out there and came home with a big bowl of goodies. Also, this year, I am learning SOOO much about gardening. Books are great, but until you actually throw seeds into the dirt, there’s not much learning going on. I am already planning my gardens for next year in my head, based on what I learned this year, and how much of what I actually like to have and eat. Today was a day of traveling. And, of visiting family from England. So, this blog is a quick post. I love the pure experience of play. Just being totally involved with the journey of playing, without any expectation of true outcome. The balloons were blown and truly, the dog creation was quite secondary to the act of pumping the balloons, tying them and then playing with them without tying them to look like anything. We seem to lose this in adulthood, looking towards results rather than experiences, goals instead of journeys. I give so much thanks to my daughter for the experience of motherhood, the journey that it is, knowing that the true results will never be shown, as I will, hopefully, be long gone before she ends her life, and her children’s children will go on, all part of the journey we are experiencing now. I like the free form of the journey, rather than the structure of results, for most things. Definitely, little A’s life is so much based on experience rather than goals. I find that when the I put goals in front of her, for many things, I find that she either forgets about the goal, or, once it is accomplished, she is fairly non-plussed about it, because it means that the game is over. She knows that the game doesn’t end. And she teaches me this all the time.